This budgeting tool will calculate the monthly amount you need to set aside to pay cash to replace those assets that wear out or become obsolete. Plus, to make you fully aware of what you are giving up in exchange for owning assets that wear out, the calculator also estimates the opportunity costs created by depreciation expenses. Being fully aware of an asset's opportunity costs in advance of actually purchasing it can also help you avoid making purchases that leave you with buyer's remorse. 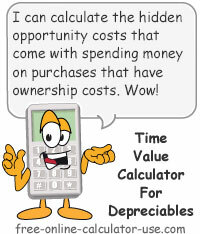 To calculate the combined opportunity cost of all ownership expenses, check out the Time Value of Money Calculator. 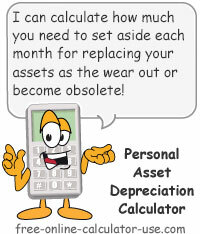 Calculate personal asset depreciation expenses to see how much you need to set aside to pay cash to replace assets as they wear out or become obsolete. Select the month and year you would like to begin your asset replacement preparation plan. Enter your Real Hourly Wage, which is your after-tax, after work-related expense, hourly wage. Enter as a dollar amount, but without the dollar sign and any commas. Clicking on the link in this row will open the Real Hourly Wage Calculator in a new window. Enter the average annual interest rate you would expect to earn on your investments. Enter as a percentage, but without the percent sign. The calculator will use this rate to determine the potential future value of the funds that are being used to purchase depreciating assets instead of appreciating investments. Also keep in mind that funds diverted from depreciating assets can be used to pay off high interest debt -- thereby increasing the opportunity cost of buying and maintaining depreciable assets. 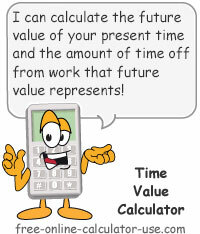 Enter the number of years you would like the calculator to calculate opportunity costs for. Typically this would be the number or years between now and when you plan to retire. To add an asset, complete the 7 fields, tap the "Calculate Stats" button, and then tap the &plus; button (may also appear as "Add" or "Add Asset" depending on the width of your device). To edit an asset in the list, select the entered asset from the menu. This will load the asset into the form for editing. When you're satisfied with the changes you've made, tap the "Calculate Stats" button and then tap the S button (may also appear as "Save" or "Save Changes" depending on the width of your device). To delete an asset from the list, select the entered asset from the menu. This will load the asset into the form for deleting. Tap the − button (may also appear as "Delete" depending on the width of your device). To clear the form to create a new asset entry, tap the C button (may also appear as "Clr" or "Clear" depending on the width of your device). Important! The entered assets are saved in your device's random memory (temporary storage), which means that if you surf to another calculator or close this browser window you will need to re-enter your assets. Each entered asset will appear in this menu as you enter them, sorted by the asset name. To edit or delete an entered asset, select the asset from the menu and the calculator will load the asset's saved variables into the appropriate fields below this line. You can then either edit and save the changes, or you can delete the asset from your list. Enter the name of the asset, preferably using 20 characters or less. The asset list will be sorted alphabetically, so if you want the list to sort by location, for example, begin the name with an abbreviation (LR Television, LR Ceiling Fan, etc., for Living Room Assets). If you want to sort by numbers, be sure to include leading zeros (001, 002, 003, etc.). Enter the amount you think you could sell the asset for right now. Enter as a dollar amount but without the dollar sign and any commas. You can get a good idea by referring to classified ads or by visiting second-hand stores that sell the asset. If you are making payments on the asset, enter the current principal balance of the loan. Enter as a dollar amount but without the dollar sign and any commas. Enter your best estimate of how much it will cost to replace this asset at the end of its useful life. Enter as a dollar amount but without the dollar sign and any commas. You can get a good idea by looking up the prices on online stores, and then adding amounts for inflation, taxes, shipping fees, delivery charges, extended warranties, etc.. It's always best to estimate expenses high and have money left over than the other way around. Enter the current age of the asset in number of years. Enter zero if the asset is brand new or if it has not yet been purchased. Enter the number of years you expect the asset to last. The total of the current age of the asset and the remaining useful life should add up to the life expectancy of the asset if purchased new. Note that the end of an asset's useful life is typically when the repair costs add up to more than the salvage value (cost more to repair than the asset is worth). If you're not sure how long a type of asset typically lasts, tap the button in this row to open a Useful Life reference tool. Useful Life Examples: Select a category from the menu above for a list of useful life examples for the category. Enter the amount you believe you could sell the asset for at the end of its useful life (expected trade-in value, scrap value, junk dealer value, etc.). Enter as a dollar amount but without the dollar sign and any commas. This is how much you will need to set aside each month in order to replace the asset using cash instead of credit. Keep in mind that this expense is on top of any monthly payment you are currently making on the asset. This is how many work hours you will be exchanging for the asset each time you need to replace it. This is the difference between the current cash value and any balance owed on the asset. This amount represents how many hours you could take off from work (discretionary time) if you sold the asset and used the proceeds to purchase essential goods and services instead of allocating that time to working in order to pay for them. This amount represents the future value of the savings that would occur if you sold the asset and never replaced it. In other words, if you invested the proceeds of the sale, along with the monthly depreciation savings, this is how much your investment would be worth based on the interest rate and length of time entered in the top portion of the calculator. This amount is the potential future value divided by your net-hourly wage. In other words, if you sold the asset and never replace it, and then invested all saved amounts, at the end of your entered investment term you can use your investment to purchase essential goods and services instead of having to work this number of hours to pay for those goods and services. Select the report type you wish to display and or print. You can change your selection at any time and the selected report will be displayed below this line. Each report type will be following by a button to create a printer friendly version of the report. Note that for the 4th option you will need to first select an asset from your entered list at the top of the previous section. Select the month and year you would like to start your asset replacement planner. Enter your real hourly wage. Enter the percentage return you expect to earn from your investments. Enter the number of years you would like the calculator to calculate opportunity costs for. For each of your assets, enter the name, resale value, amount owed, replacement cost, age in years, useful life remaining, and salvage value. Next, press the "Calculate Stats" button and then press the "+" button (may also appear as "Add" or "Add Envelope" depending on the size of your device). When you are satisfied with your asset entries, select the desired report type and press its accompanying "Printer Friendly Report" button. This will open a new window containing your selected report. What depreciable assets are and why ignoring them will bust your budget. Last longer than 1 year, but eventually wear out or become obsolete and will need to be replaced. The cost of replacement requires months or years to save up for. Appliances and fixtures, such as refrigerators, washers, dryers, microwaves, dishwashers, ceiling fans, ovens, stove tops, etc. HVAC: heating, ventilation, and air conditioning units. Electronics, such as computers, security systems, entertainment systems, etc. Home furnishings, such as couches, beds, tables, etc. Powered equipment, such as lawnmowers, garden tillers, power tools, garage door openers, etc. Motorized vehicles, such as cars, trucks, motorhomes, motorcycles, boats, 4-wheelers, snowmobiles, jet skis, etc. Non-structural building components, such as flooring, siding, decking, paint, roofing, windows, doors, etc. Landscape, such as paved or concrete driveways, retaining walls, lighting, storage sheds, etc. To see a list of depreciating assets common to most homes, along with their estimated life expectancies, see the the National Association of Certified Home Inspectors Standard Life Expectancy Chart for Homes. I would love to provide a direct link to the study done in 2006 by the National Association of Home Builders (sponsored by Bank of America Home Equity) entitled, "Study of Life Expectancy of Home Components", but the study has mysteriously been removed from the NAHB site. Since I could find no explanation as to why the report is gone, I can only speculate NAHB and the banking sponsor no longer consider the report to be in their best interests. Don't replace the asset. This is fine for recreational vehicles, but you can't go without a working refrigerator. Plus, failing to replace components of your home as they wear out will diminish the value of your home. Rob money from other budget categories. Of course, the first category to get robbed is the most difficult and painful to cut back on: the entertainment category. Hence, most opt for number 3. Purchase the replacement on credit. But what happens then? That's right, your monthly obligations increase. Again, this leaves you less money to spend on entertainment and other perks that should come with being a hard-working individual. This explains why failing to budget for the replacement of your personal assets eventually leads to a mountain of bills, a diminished lifestyle, and a deteriorated home. Want to get off the increasing debt treadmill? Want to fix your finances? Start setting aside cash to replace critical assets as they wear out. That's because the amounts you are setting aside are on top of the payments you are making on all of your past purchases. Trade your essential assets for less expensive alternatives and sell off your non-essential assets for cash. Then apply the freed-up cash to your rapid debt reduction plan. Later, once you've become debt free, you will then be able to replace your non-essential assets using the money that is now going to pay interest on your debts. While downsizing is not easy, it is likely the best chance you have to get out of debt and stay out. And sure, you will face budget setbacks on your journey to paying cash for asset replacement, but you will eventually turn the corner -- as long as you don't give up.